I apologize for being absent lately. Sometimes we have to make choices and prioritize to address more pressing matters. Thank you for being patient. Two articles came to my attention this week on writing and critique groups. Guide to Literary Agents, Chuck Sambuchino, in his article, discusses The Top Ten Worst Types of Critique Partners. Included among the attendees one might encounter were: The Snob, The Time Hog, The Retro, The Distractor, The Harsh Critic/The NiceyPiecey, The Debater, The Picker, The Sulker, The Boss, and The Sporadic. Elmowrites describes in Critique and Critics, the attendees to her first group with slightly different names. The Fan, The Ogre, The Stuck Record, The Feeler, The Mechanic, and The Holy Grail. You get the gist. Having belonged to a critique group for the last couple of years, the titles intrigued me. The “type casting” of members, however, left me wrinkling my brow. I won’t rehash the definitions here; you can read them for yourself. Whether it was one of the above personalities or group dynamics, the experience left a less than stellar impression on the authors. Still, in the end, both acknowledged the importance of feedback and encouraged writers to keep looking for a writing or critique group. Reading these articles made me wonder, was this the group experience of most people? It hasn’t been my mine. I belong to a wonderful writer’s group, the South Carolina Writer’s Workshop (SCWW). We’re diverse in our experience, opinions, and genres. I imagine there are things in areas other than writing we might not see eye-to-eye on; I wouldn’t know and I don’t ask. We discuss writing. We focus on genuine critiques, helping each other improve, and get published. We promote each other’s blogs, author pages, websites, and publications. We’re writers supporting writers. So, here’s what I say: You can have a good group experience, but you have to participate. You can’t just be an observer. Here are my ten suggestions for a successful group experience. Find a group, or start one of your own. Growth comes faster with feedback. The group should have a designated leader who can moderate a meeting. Make the focus on writing, not people. Be prepared. Members are less disruptive if they’re prepared and know what to expect before the meeting. We find sending work in prior to the meeting an effective method. Don’t confuse social activities with the group meeting. The focus gets lost in the gossip. When difficult members do surface, let the leader or group moderator handle the situation one-on-one. Be respectful of each other’s, work, time, and the group. Take time to familiarize yourself with group etiquette. If your group has guidelines, honor them. Know your own voice. It’s your story. Ultimately, you are responsible for your writing and any experience you may or may not have. All critique groups are not the same, don’t give up the first time. It takes time to get to know people and the dynamics of a group. Instead, stick around, learn to listen, and speak up. You might just find yourself a group. Leave me a comment. Let me know about your group experience. 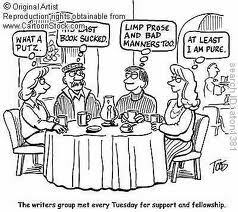 Does a writer need a critique group?